#1 – Sales of Wintertide have been GREAT with matching reviews to match. We are “almost done” and it looks like the series will end with a bang. Since the release of book #4 Michael has been averaging about 1,000 books a month – not too shabby for a new author from a small publisher…but since Wintertide the sales were 2,500 (october), 7,500 (November), and 10,500 (December) !! Thanks so much for all the support. #2 Percepliquis editing is coming along very nicely. We’ve done several rounds of edits (most of the major edges are filed off) and we are just tweaking wording at this point – so that is going along nicely. 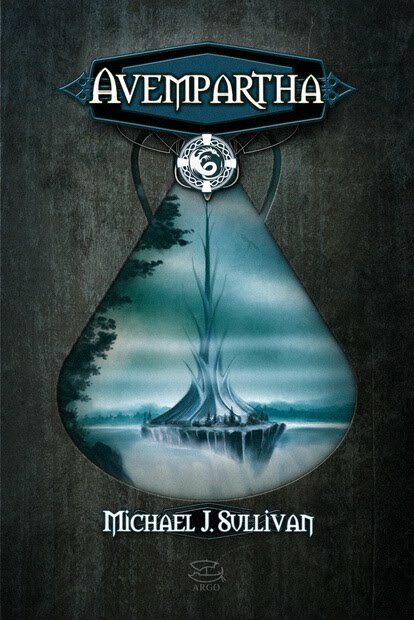 #6 Speaking of Honors…Iceberg Ink (a great fantasy review site by the wasy voted The Crown Conspiracy the Best Read of 2010! Well technically he called it a tie with Suzzane Collin’s Hunger Games – but in his review he said it beat that book so I’m calling it a “win” for the home team. If you’ve not read his reviews you might want to check them out. Here is a link to that page. #8 A contact we have “in the business” pitched Michael’s book for a movie deal to the owner/founder of the production company that put out “The Mummy Series” and a whole host of other movies. They passed but said they might revisit depending on sales. I’m still pretty impressed it got in front of someone at “that level”. The person “shopping it around” is still on the hunt. 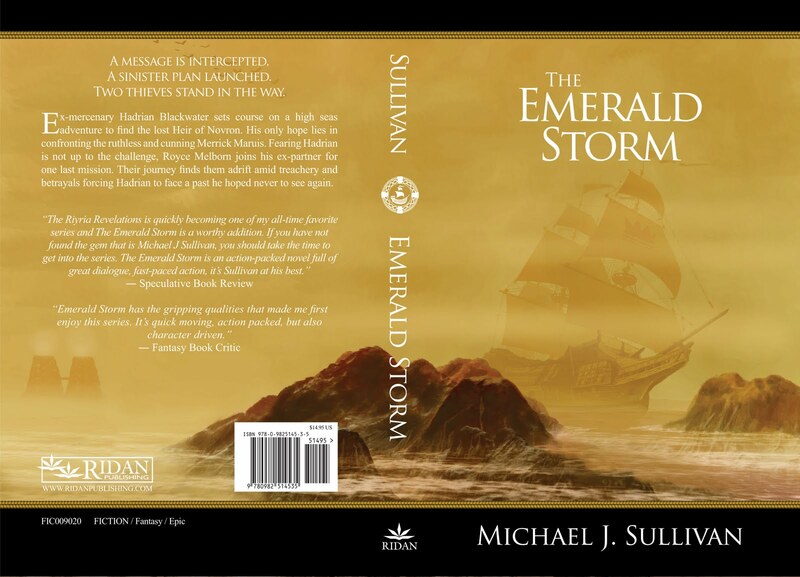 I’ll have my (long awaited) review of The Emerald Storm coming in some time next week, and then I’m going to get started on Wintertide (yes, Robin, send it through already!! 😉 ). Where The Crown Conspiracy was an excellent introduction to the series and Avempartha was the book that really got the ball rolling, putting the heroes in danger and setting up the conflicts that will probably see us through to the end of The Riyria Revelations, Nyphron Rising is a tale of adventure that is much more subtle and, in its own way, powerful than the first two novels. One of the ways that Michael does this is by giving us deeper looks at Royce, Hadrian and Arista. 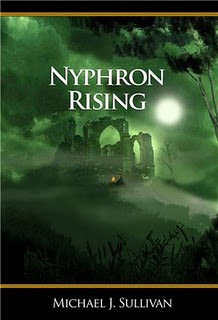 Sure, we’ve gotten to know them while submerged in the first two novels, but in Nyphron Rising Michael reveals even more about them – Royce has had a secret revealed to him that changes, on many levels, his relationship with his friend, Hadrian, and Royce is forced to take responsibility for the decisions he’s made, even though it might cost him Hadrian’s friendship. Seeing this side of Royce was great because it gave us a glimpse of the half-elf that we haven’t seen before – he’s a bit out of sorts, unsure of himself and doesn’t know which path to take, creating not only a conflict within himself that he needs to work through but also a conflict between him and Hadrian. I’m pretty sure that Michael has more evolution in store for Royce and it’ll be great to see him at the end of the series, evolving as he is. Hadrian, on the other hand, has much to contend with; he is as unsure as Royce and and is struggling with his place in the scheme of things. Witnessing him battle through it all was a satisfying journey – the man you’ve come to know through two novels has changed, and much for the better. Arista was more enjoyable than she’s been – witnessing her in various states that she would never have allowed herself to be caught in (not if she was still safely ensconced in Melengar) was led to some hilarious scenes, but Arista also shows herself to be stronger than even she suspected. Michael puts her through the ringer in Nyphron Rising and at the end, she’s in a place that she would probably have never chosen for herself but she rises to the challenge, as you would expect the friend of Royce and Hadrian to do. 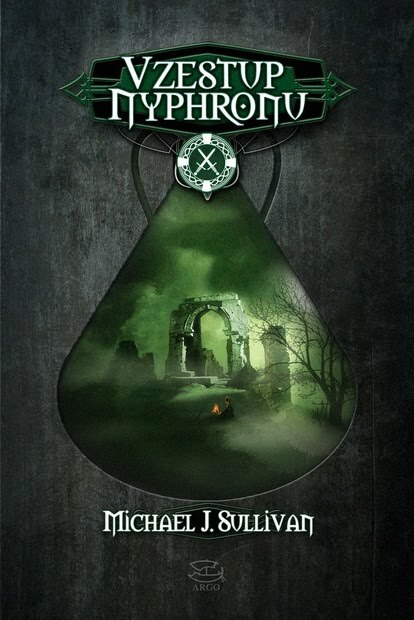 The novel is populated with many other great characters, especially a group of cut-purses and thieves living in the city of Ratibor, a young man who fearlessly stands up to speak against the establishment, and the newly-crowned Empress, lost and alone after the events of Avempartha ; they, and many others, provide ample great glimpses at all the levels of society that permeate the kingdoms that make up Elan. One of the characters that almost stole the show for me was Amelia: she’s feisty, determined, and really steps up to the sudden change that’s thrust upon her life. Plot-wise, the book is a somewhat slower read than The Crown Conspiracy and Avempartha, but the pacing works very well – Michael layered the tale, making this a read rich in detail and drama. Sometimes I found myself thinking, “Okay, now they’re buggered!” only to have the situation really be revealed, and Michael stunned me with a revelation at the end that really sets up the fan and what’s going to be striking it in the rest of the series. All things considered, Nyphron Rising is a hugely entertaining and subtly gripping novel – it’s a much deeper read than the previous books in the series and an excellent staging point for the next 3 novels. I’m looking forward to seeing how the conflict widens and just how everybody will get out of the trouble that is surely coming. The Riyria Revelations is a series that can stand tall alongside any other Epic Fantasy series out there – all the action, intrigue and drama you’d expect and plenty of surprises! To find out more about Michael and his work, check out his website here; you can also order the books at his site. TWO THIEVES STAND IN THE WAY. This news was originally posted over at Realms & Galaxies: Celebrating SFF on the 28th of December 2009. But what does this mean? Well, basically, if your order your copies of Book 1 The Crown Conspiracy, you wont get the book in the advertised time because it’s on back-order, awaiting stock (i.e. the second print run). You see, the entire print-run has sold out. Awesome, awesome news, no doubt about that, but that means that thousands of readers, wanting to dive into the world that Michael has created, will be out of luck getting copies of the book. 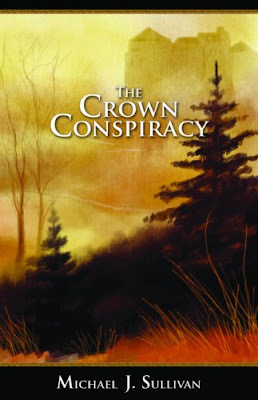 Using this link (which will take you through to Michael’s website), you can order copies of the The Crown Conspiracy, and you’ll be able to get copies! 🙂 You see, they bought several hundred copies! So hundreds of lucky people out there will be able to get hold of the book and start their journey into The Riyria Revelations! 🙂 Also, Avempartha and Nyphron Rising are also available to order; there’s still stock available of those two books. You may see, however, that the books are a tad more expensive than what they cost on Amazon, and that’s totally understandable; I mean, how exactly would Michael be able to match the discounts that Amazon offers? Well, here’s the solution: Michael offers a 15% discount, plus he will personalize the book for you – that means a signature and/or dedication. 🙂 And that includes not only The Crown Conspiracy but Book 2 and Book 3, too. 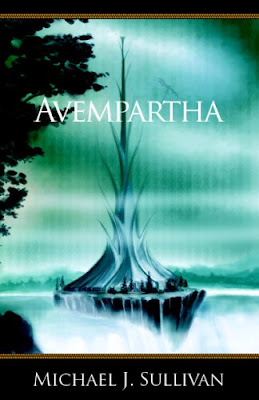 Avempartha picks up some time after the events of The Crown Conspiracy, a well-made decision indeed; This deepens our belief in the world Michael has created and helps us to feel more comfortable in it –after all, to write what are essentially stand-alones that can also be read together in series there needs to have some kind of separation between the books; the fact that time has passed since we last saw the characters adds a depth and realism to the story that works very well. 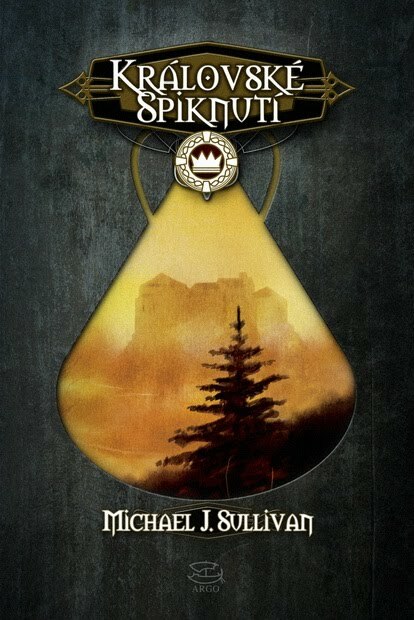 All in all, Avempartha is not only a great book in its own right, delivering on Michael’s promise to give us stand-alones within a bigger story-arc, but it is also a better book than The Crown Conspiracy, showcasing Michael’s crowing talents as an author who is sure to become a Name in the industry. 🙂 Well worth a read! We begin our journey through the book with Archibald, a minor noble who has a scheme to change that ‘minor’ status into ‘major’; he has in his possession something with which to blackmail a noble with more connections and property, but the plan backfires when Archibald can’t come up with the goods because they’ve been stolen from right under his nose – from then on, the tale surges ahead! We meet the thieves and their friends, the royalty and the nobles and their enemies; we are taken right across the kingdom to a place that shouldn’t exist, and a tale begins to take shape of an ancient betrayal, a betrayal that shaped the whole world and the lives of those who call it home.